Radial Shockwave Therapy is an excellent alternative for people with chronic pain who have exhausted all other treatment avenues (e.g. physiotherapy, chiropractic, massage therapy, etc. ), and is often used as a pre-surgery option. Radial Shockwave Therapy has been scientifically proven to help relieve chronic pain associated with heel spurs, tennis/golfer’s elbow, achilles tendonitis, frozen shoulder and many other conditions that cause chronic pain. Radial Shockwave Therapy is the application of a high-energy acoustic pulse transmitted into the tissue of the affected area of the body. 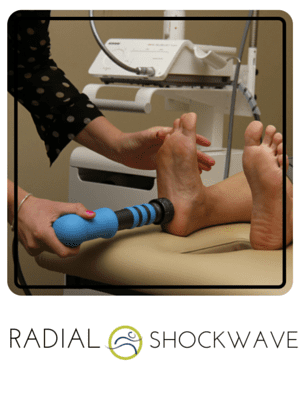 Each Radial Shockwave treatment works to increase the metabolic activity around the site of pain or discomfort, stimulating the reabsorption of irritative calcium deposits in tendons and stimulate the body’s natural healing process, thus reducing pain. Radial Shockwave Therapy typically requires three treatments one week apart for optimal results. Some more stubborn conditions may require 4-5 treatments. Most patients feel significant improvement of symptoms after only the first treatment. Treatment is carried out by passing over the injured area with the shockwave applicator. Guided by your feedback, the exact positioning of the shockwave applicator is determined for optimum results. The treatments last approximately five – ten minutes and may be slightly uncomfortable, but are well tolerated by everyone. How Do I Book An Assessment For Shockwave? You can call our office at 780-980-5443 or BOOK HERE. We will do an assessment to determine whether or not this technology is appropriate for you. Radial Shockwave Therapy costs $150.00 per treatment . You will be required to pay for this therapy up front and then submit to your insurance company. Radial Shockwave Therapy is still considered a physiotherapy treatment, therefore your insurance will cover the same as it would for regular physical therapy. We can direct bill for some insurance companies, and the patient is required to pay the remaining portions. Read our latest post about resolving heel pain with shockwave ! Image 1 denotes Shockwaves as generated by Swiss DolorClast Master and the RADIAL handpiece. In picture 2 notice the cavitation bubbles that form a short distance from the applicator tip of the handpiece.